How to review, add and remove devices from your Fastcall profile. A device is used to make outbound and receive inbound calls using Fastcall. It’s distinct from caller ID, so you can use a device like your personal mobile phone without showing the telephone number to the customer. You can set up multiple devices in Fastcall and choose which ones to use – you might have your home phone, your work mobile, your personal mobile, your desk phone, etc. See the training unit on making outbound calls for an example of this in action. You speak to the customer over your mobile phone, it’s recorded in Fastcall as usual with a task record as usual. Devices are controlled from the settings menu, under My Settings > Devices. 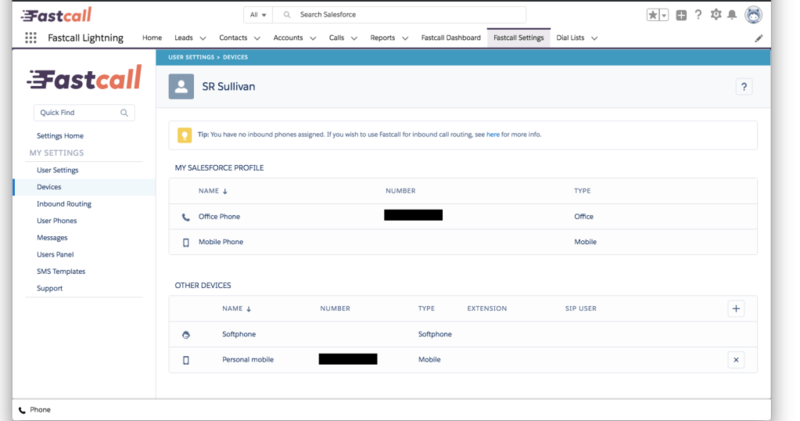 Two devices, your Office Phone, and Mobile Phone will be imported from your Salesforce profile automatically. Another device, the Softphone, will be present under ‘Other Devices’. The softphone is a software phone on your computer, which uses your computer’s microphone and speakers (preferably with a headset!). You can then add more devices using the ‘plus’ icon. You need to specify the ‘Label’, ‘Number’ and ‘Device Type’ (Mobile, Office or SIP). If you choose a SIP phone, you also need to provide the username and password for connecting to the phone. You do not need to verify a device with Fastcall since the device is not used as caller ID. You can delete the device by clicking on the ‘x’ icon on the right of the device. You cannot delete the default devices. Once you’ve added a device, it will be available in the Widget so you can pick it for making an outbound call. It will also be available for use in inbound routing.